The Philippine Drug Enforcement Agency (PDEA) has closed down an ecstasy laboratory. This is the biggest dismantled laboratory in the history of the PH. PDEA arrested Chinese national Jiang Minshan, 53, and his Filipino driver Lauro Santiago, 59, through search warrant. Jiang and the four arrested Chinese chemists in Batangas who are members of the Dragon Wu international drug syndicate operating in Asia, a from unnamed Hongkong-based financier. They are connected with “Golden Triangle” operating from the borders from Thailand, Laos and Myanmar. 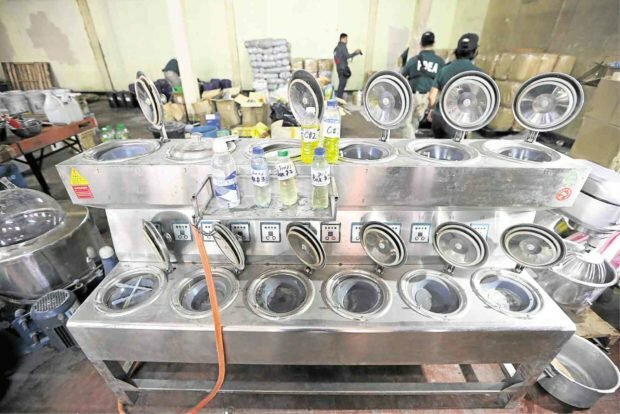 “This is the first time in the country’s drug law enforcement history that a clandestine Ecstasy laboratory was closed down,” PDEA director general Aaron Aquino said. Among confiscated were large amounts of controlled precursors and essential chemicals used in the production of Ecstasy, various laboratory equipment and apparatus, and tablets of the drug.